This thread will be dedicated to host a list of links to the websites/blogs of overland travelers around the world. Two things to keep in mind: One, is that there are hundreds of blogs out there. Two is due to the finite nature of most expeditions, some links are to trips that have been completed or are on pause. All of the links will lead to wonderful adventures, photos and insight that will be useful for future travelers, couch travelers and folks wishing to live vicariously through others. This is a work in progress and since there are trips and blogs being "born" everyday... it will always need input. I think the King and Queen of long range overlanding should be first Emil and Liliana Schmid http://www.weltrekordreise.ch/ the world record holders… they have been on the road for more than 26 years (as of 2010) driving an FJ60. Their site is a little hard to navigate but well worth it. Landcruising Adventure: Marijke and Coen, a Dutch couple have been driving their ’84 Diesel Landcruiser since 2003… methodically and slowly visiting getting to know the Earth, they are really doing it the right way. Discover Share Inspire are the Denning's and they are an amazing story to follow. A family of Seven (yes 2 parents and 5 children) driving around the Americas slowly and deliberately. They have a free book entitled: "Living Deliberately: How We Created a Ridiculously Awesme Life"
Home on the Highway are James, Lauren and they are driving around the Americas in their '87 4Runner. Drive Nacho Drive in their own words: At the end of 2011 we quit our jobs and set off in our 1984 Volkswagen Vanagon, "Nacho". Our plan? To circumnavigate the globe, slowly, while discovering culture, food, recreation, and emergency roadside Volkswagen maintenance. We are Brad and Sheena. Just wingin' it. Going Overland Follow Helen and Paul as they drive their Land Rover around the world. Overlanding in their words: "Overlanding is not about ticking off miles or destinations visited, chalking up experiences or collecting souvenirs. It’s an opportunity to stretch ourselves, get outside our comfort zone, to learn from that experience. It’s a state of mind, a lifestyle choice, a chance to learn to live with the rhythms of nature, not protected from the earth by a layer of concrete and a Tesco’s down the road." Patagonia or Bust are Joe, Kylee and their killer Tacoma (check it out). 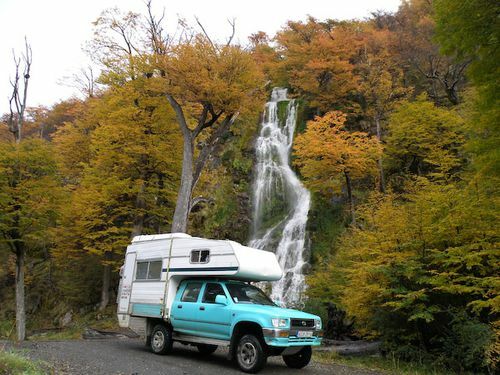 On October 2012 they started off on a cultural and personal expedition driving from Hood River, Oregon to Patagonia, Argentina. Along the way discovering the best waves, mountains and market food Latin America has to offer. 30 for Thirty in their own words "An open ended, open minded journey stretching from Seward, Alaska to Ushuaia, Argentina along the PanAmerican highway and whatever other highways, byways, roads and adventures that await us." Where the Eyes Go Kaytie, Christian and their 2002 are driving around the Americas. In their words: "The car goes where the eyes go." This mantra will always be symbolic in our life but it will also be a very literal guide for us on our upcoming road trip through Mexico and Central America. ExPo member 048642 introduced us to Les Bourlingeurs (The Globetrotters) Marc and Gwendolyn a French couple traveling the world in a 70 Series Landcruiser. They are firm believers in the French porverb "Tout ce qui n'est pas donné, est perdu." It roughly translates to; "Everything that is not done, is lost." Their website is jampacked with entertaining and useful info, but reader beware: it is in French. Tread the World, Lesley and Bruce are traveling with their Unicat Unimog. Aymará and Juan Francisco are "Uniendo las Tres Americas" (Uniting the three Americas) in their drive around the Americas in a beautiful '67 Estanciero. Ar Muin na Muice, "To be on the pigs back", an old Irish phrase meaning to be lucky or well off. That is the title of Donna and David Keegan's adventure and website. The Keegan's are driving from Ireland to Cape Town in a Landcruiser. World Experience (portuguese) Brazilians Danusa, Fernando and their trusty Land Rover are driving around the world. M.E.L.T. America: Malena (2.5), Ezequiel (35), Lucila (34) and Tomás (5), a family driving their 2010 4Runner from Argentina to the U.S. Completed trips, tons of great info from folks who completed overland trips. Life Remotely are Jessica, Jared Kobus and Blue, their 1997 Toyota 4Runner. They left Seattle October 6, 2011 to drive the Americas for at least 15 months. UnURBAN is a Norwegian couple, Malin and Espen driving a 2004 Nissan Patrol. In their own words: “unURBAN is a crew of two having time off and doing fun things. Part one is a drive across North AMerica from north to south, part two is driving South America from north to south and the next parts are not yet decided.” UnUrban has evolved to include Africa South to North on the West side with short hiatus' for work in Antartica! Awesome stuff. Ruined Adventures. In their words: Brenton & Shannon driving from Texas to Patagonia, zig-zagging all the way across the Americas. We're currently taking our time through Mexico, but we'll get there eventually. After South America there's a strong possibility we'll head to Africa. American Recess are Logan, Reid and their dog Zephyr. In their words: Road tripping from Reno, Nevada to the tip of South America. Getting married in every country and loving every minute of the wild ride. Me-Thee-and-Bee, Gregg and Emma have been on the road since April 1st 2009 with 'Bee' their trusty Land Rover on their Grand Tour of the World. A Long Drive is Shreesh and Neena, a couple that drove an FJ Cruiser from Alaska to Ushuaia. This is Dan’s website, we like the name “The Road Chose Me, 50,000kms of Ebb and Flow“. Dan is driving from Alaska to Tierra del Fuego in a bone stock Jeep with minimal equipment. His drive proves that all you need to do is get up and go! Dare2Go Juergen and Yasha drove around the Americas for more than 3 years. Their site is a treasure trove of information. The Darien Plan Kristin and Chris drove their Honda Element bas E-Camper around the Americas. Nessies Adventures, Rose and Dave have had some great adventures; they drove a Defender 110 300tdi around Asia from August 2006 to July 2008 and they are have been exploring South America since June 2009 in a 1978 Mercedes Benz 911 LA 4X4. Joydrive Kelsey and Tom drove Marlin a '91 VW Golf GTI around the Americas. RambleWriter Rochelle, Nick and Domino the dog drove their 4Runner around the Americas. Rochelle is writing a guide intended for folks preparing to drive the Americas. VWViaje Follows Jeremy, Derek and Jake on their Americas drive in a 1987 Westy. The World by Road is an expedition that successfully circumnavigated the globe through 68 different countries, over 6 continents, covering 70,000 miles in 2 years and 147 days. Nicolas Rapp and his TransWorld Expedition. Nicolas drove around the world in his 1996 Toyota Landcruiser. Americaencitro: an Argentinean couple driving from Argentina to Alaska in their 1970 Citroen 3cv. Les GlobeTrotteurs (The Globetrotters), Marie and Pascal from France/Montreal are driving their Ford F-150 from Montreal to Argentina. WaggelAdventures are Wilma & Marcels a Dutch couple who are traveling the Americas in their decked out 23 year old IVECO truck. The Vagabond Adventures of Lucie, Lachlan and BowWow. Awesome trip and site. Les 5 Doigts de la Main (The 5 Fingers of the Hand) is a family of 5 driving around the world in a Land Rover with dual Howling Moon RTT's. Very cool website, some parts are in English, most in French. White Acorn is the website and trip of 2 retired Aussies relating their experiences of a thourough America's deive. They live/drive a Provan Tiger CX at home on a 2007 Chevy Silverado 3500 Extended cab with a duramax/allison package. Their website includes tips for other overlanders and a very detailed "camping spots" list for the Americas. Life of Saturdays or 95 Degrees South follows the adventures of Kacey and Dave as they drive through the Americas. EDIT: All new links will be in this first post! Scott (Expeditionswest) started a very similar thread in 2006!!! I will try to go through it and transfer links from there to this thread. That is a great list so far! Some I have heard of and read, many I have not but look forward to reading! I'd like to see some links to families travelling around. Igor and his family of 5 are in Brasil. Then there are two families on tandem bike that we know of. We met one of them recently: the Verhage family and the Vogel family. Nice info, but wanted to clear out a point read on Nicholas Rapp's Transworld Expedition in his 1996 Toyota Land Cruiser where he wrote that he avoided to travel through Chile "due to the problems it was facing" .. what problems my God ? My dear , he missed on of America's cleanest, safest, organized, and friendliest country (remember Paris Dakar Rally ? , this next 2011 again here ... for some reason you might ask yourselves). I hope he meant because of the earthquake in late Febraury '10 (but now you don't even notice anything of this , don't remember we are talking 8.8 scale where in other parts of the world over 300.000 souls died). In fact, Chile is the most stable economy and safest country around and next year will be the 3rd economy in the world to expect largest economic growth only following China and India accoding to Wall Street Journal's experts (not bad for a country of only 16 million compared to those of 500 million and 300 million souls). For a tourist, traveller or expeditionist , Chile with its Atacama Desert in the north and Patagonia in the south, is a dream come true. There are many more out there. I don't want to hijack this thread. But there is a great website out there who does sum up a lot of good websites: The Africa Overland Network. There is no Hijacking here, this should be a collaborative effort. There are too many travellers out there for me to keep up. I am on the road. In fact I have a feeling that maybe the format of this thread may not be conducive to have an endless list of links. Any ideas of how we could do this in a way that links would be better organized and more easily accesible? The other issue is language. Like Coen mentioned, most families traveling are French and therefore their sites are in French, should I post them here? There is an insane number of German overlanders, some of their sites are in English... most in German, do I post those? Personally I find that if the website looks interesting from an adventure perspective, then I'll be glad to use Google translate. Sure, you get a lot of really strange translations, but you will also get the excitement and adventures they are trying to tell you. The mindsets of overlanders are quite similar, no matter what country you originate from. I agree. Google translation is quick, easy and not too bad at all... It works well enough to get the point across, most times quite clearly. Go ahead and post them up with "in French" or "in German" in parenthesis. If I just had a couple of minutes for some quick travel inspiration I'd probably pass them up.. but then come back to them at a later date when I had more time to glean what I could. I know that www.ihana.com happened quite awhile ago now but it is still the best Latin American travel site out there in my opinion. I've been through and through it and can never get enough. Another one in progress - Alaska to Argentina! I have added a few more sites. There are so many out there! I hope I did not bite of more than I can chew :victory:. I will start adding other languages and completed adventures. Josh, Ihana is an awesome one that we read thoroughly when we started planning our trip. Keep in mind that we are on the road ourselves, so posting links will not be daily. Keep the PM's, posts and emails coming. Thanks for the help. This is the blog of Kym and Lyn Bolton, Australians who are in the middle of a round the world adventure. Starting in Brisbane, they shipped their vehicle north to Kuala Lumpur, and to date have driven 20,000 kms north through southeast Asia, Nepal, western and central China, Mongolia, and now Russia. Kym and Lyn are familiar with Russia. They drove the Road of Bones through eastern Siberia, and on through central and western Russia and Europe in 2007. They stashed their vehicle in England, and returned to drive south through France, Spain and Morocco in 2008. You can find links to their blogs about those trips on the goannatracks.com web site. Upon reaching Vladivostok in October, the Boltons will ship their vehicle to USA for adventures in 2011. In 2012, Central and South America are on the agenda. The French family of five has become my inspiration. 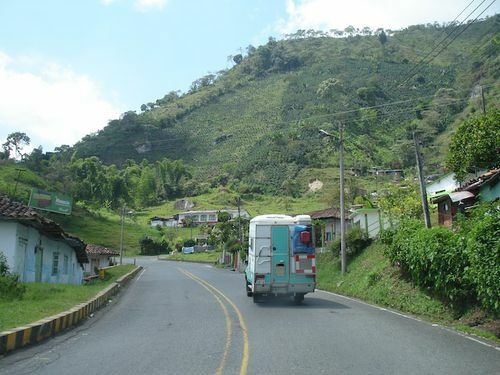 They drive through the US, Canada, through Central American, and down into South America. The pictures are great. http://ramblewriter.com/ This couple from North Carolina inspired me to prep my 1st gen 4runner for a Pan Am adventure. They've been writing a book of their travels, but I'm not sure if it's finished yet. http://joydrive.ca/ from Calgary to Ushuaia in a '91 VW golf. :Wow1: Impressive they didn't elbow each other to death...not a ton of room in those. http://www.thedarienplan.com/ They did the Pan Am in an Ecamper. http://southboundhound.weebly.com/ Another 1st gen 4runner (sorry, I'm biased!) driven by Jeff Sarmento with his faithful dog Nota. I've exchanged some emails with Jeff and he's been very helpful. He's currently working on a book about traveling with four-legged friends. http://www.alongdrive.com/ a Canadian couple in an FJC. http://southboundexplorers.com/ Canadians in a VW van. Thanks red, I knew all the sites you mention except for SouthBoundHound. Ramblewriter and Joydrive are two of our favorite sites (Lacey and I). The reason I have not posted them yet is because they have all completed their journeys. I am preparing a "completed journey" links section. Keep posting if you find more. Are you planning a drive? Have a site? Dates?